The elegant Grade II Listed Georgian building on the west side of the market place was once the Doctor’s surgery but is now the Post Office. There is a small lockup at the back. The rest of this side is open except for the isolated Carpet Shop at the entrance to the market place which is the only building remaining from a complete row known as the Shambles, which consisted of the Slaughter House, Butchery and Fire Station. The Vaults which stands in front of the church is only one room deep. There are many cellars under the market place from the Vaults, but these are now mostly bricked up. The Post Office is the result of an ancient encroachment into the Market Place made without permission of the Lord of the Manor that was left unchecked until it was too late to correct. When did this happen? Certainly no later than the Civil War, but more probably earlier, when one of the market traders was allowed to keep his stall erected for long enough to establish permanent occupation and use. By the year 1800 a wine merchant named James Hill was living with his wife Hannah Margaretta at what is now the Post Office building. A shrewd businessman he acquired a great deal of property including the Unicorn Inn, the Vaults, the Swan Inn. He is credited with bringing banking to Uppingham. Prudently he settled the family home on his wife and placed £6,000 in trust for their daughter whose husband, also a wine merchant in the City of London, became bankrupt leading to foreclosure and sale of all of Hill’s former properties. Twice in the 19th century the Post Office became home to a doctor’s practice, residence and surgery. In the 1840s and ‘50s John Lodge MRCS, LSA surgeon and apothecary practiced here. There followed an interlude from 1856 when it was Miss Jemima Adam’s school for girls. This did not last and from 1861 it was rented for 1 – 2 years by Reverend Thring as an overflow classroom for teaching Uppingham School pupils. Thereafter the property became once more a doctor’s practice, the residence and surgery of Dr Frederic Warren Brown, surgeon. A feature of the building is the downstairs room, later the post sorting office, noted for the chill from its stone floor used by both doctors as their mortuary. Whatever his skills, Brown was no businessman, leaving his property heavily mortgaged in all directions. 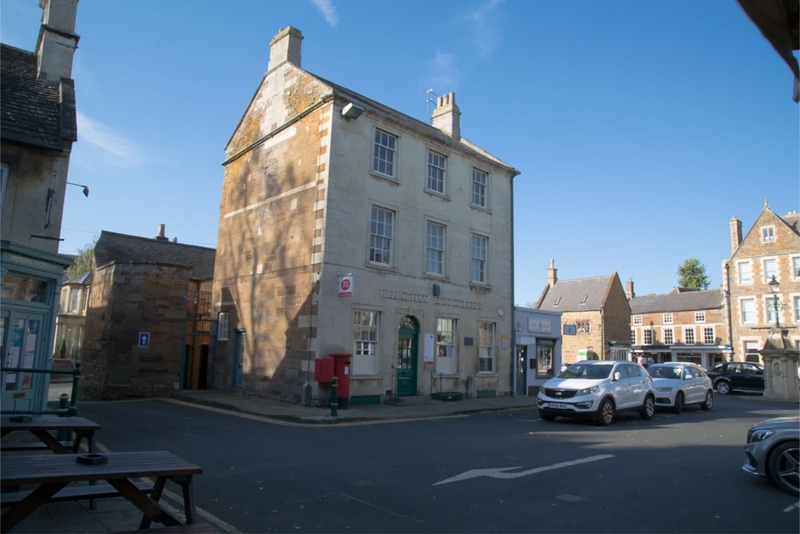 In 1896 the building became the Uppingham Post Office as it continues to this day. Previously the post office had been where the garden of the Garden Hotel in High Street West is now. In that year the building was leased by the Post Master General as a Crown Post Office at £60 a year rent increased to £75 in 1944. Eventually in that year it was purchased by the Crown only to be sold in 1984 to the late Keith Toon. Between the windows to the right of the entrance a small plaque commemorates that it was here that Her Majesty Queen Elizabeth and Prince Phillip were greeted by Councillor Alan Snodin, Mayor and Uppingham Town Councillor on their Majesties’ visit to Uppingham in June 2001.